Work and pro-website response update! The list of post houses I've sent a link to has shrunk a bit due to some shop closures and changing of hands. They number went from 73 to 63, yet still a really good list. So far I've received about 12 responses. Some that they really like my work but there's no available work at the moment, saying they'd put me on their list. Others responded very favorably about my talent and experience, saying they were going to pass my link around to several producers. And the best news of all; one came back asking what my availability was to come in for an interview next week! Bonch (boncho.tv) is a general post house, although their listing on LA411.com says they're a commercial house. My contact there asked if he could meet with me on Tuesday or Wednesday and I said either would be fine. Expecting the exact day to be decided upon on Monday. Says that even though their roster is pretty full at the moment, he really wants to work with me in the near future, commenting that my work was very impressive. On the Happy Hour Creative side, I e-mailed them today asking about work possibilities for next week. Almost immediately they responded that they wouldn't have anything next week but would definitely need me starting the week after that....AND for at least one full month! This, as well as the interview next week, is great news. I'm certainly hoping to snag a few more interviews. Especially one dry important coincidence. As I was confirming correct e-mail addresses for everyone I noticed on Trailer Park's website that they had just posted a job notification for trailer editors. This was only four days old, which yes can be a long time compared to the quickness of responses. But still not too long that my response would be timed just right. After contacting the two people I was referred to by the head of Happy Hour, I quickly sent my link to the actual job listing. Here's keeping my fingers tightly crossed that the phone will ring or an e-mail might drop shortly about an interview! And we've arrived in Oakland....O.K. well that was at 8:10pm and we've been on a tri-state kill spree looking for food after the airport loudspeaker lied to us that restaurants were open until 9pm. They weren't. So with Bill having even MORE delays because a passenger on his eventual flight that left two and half hours later had a stroke. They had go divert to Indianapolis where he spent more than an hour waiting for paramedics to arrive and handlethe situation. We ended going off-site from the airport to find a Denny's to has a proper dinner. Now we're just waiting for Bill whose much later flight from Vegas was another 25 minutes late. He's due to get in about forty five minutes from now and we'll have to beat to the subway befor the last train at 12:20am. If we miss it, we'll have to take a very expensive cab ride to downtown San Francisco. I have faith that we'll be O.K. Nevertheless, we are SO glad to be here with full stomachs and ready to take on Wondercon....right after we sleep in a little in the morning! Thank God they don't open until noon. IT'S TIME!!! Just about to head out the door to meet Rebecca, head to the airport, and fly up to San Francisco for our second Wondercon! Turns out Bill has had some delays today. First his flight from Albany was changed from 1:45 to 4:10pm because of the nor'easter heading up the east coast. Then I just received a call from him that they'd diverted to Indianapolis due to a health issue on the plane. He expects to be there for no more than a half hour...after that, on to Las Vegas to change planes for Oakland. Looks like we'll be getting in about two hours ahead of him. Enough time to relax and have a little dinner. Probably won't get to the hotel until around midnight tonight. Luckily, the event doesn't open until noon tomorrow! Yay, extra sleep! I'll have my usual daily updates as the event unfolds! A few people have asked me to chime in about the new Wonder Woman costume from David E. Kelley's upcoming NBC series. Click on the image from Entertainment Weekly (thanks to Allen) for a larger view of Adrianne Palicki in this version of the outfit. Right up front: it's too shiny, too plasticy, and absolutely looks like a Halloween costume! I was previously aware of Jim Lee's 2010 re-design of the costume in the comics...and this new series look certainly connects to that, especially in the blue pants. However a myriad of people are very critically piping in. Fanboys, fashion designers and some major publications are calling it crap. The big problem is you really can't monkey with such an iconic costume. Superman and Spider-Man (just to name a few) hold this distinction as well. There are certain minor alterations that can be made, but Wonder Woman's look calls for nothing less than bare legs and red boots...period! This might have been a slightly better take. The Hollywood Reporter makes the case that there's 'no comparison' when it comes to Lynda Carter and that she'll 'always be the amazing Wonder Woman'. I agree that Carter will always fittingly be considered THE Wonder Woman...especially since I grew up with her in the role. I'm definitely open to a new interpretation and a new actress taking on the character. One of my main issues has been that the iconic costume would work it's best magic during the 1940's. Updating the story to present day only negates the stars, red white and blue colors and overall USA and democracy overtones. The same goes for Captain America, who I'm glad to see will be based during World War II...another iconic costume design that has remained intact for the upcoming movie with some wonderfully practical applications. Yes, I intend to check out the new Wonder Woman TV series but I'll be looking at it with a critical eye. Oh yeah, if they make this like "Lois & Clark" I'll be annoyed. JUST STOP ALL THIS NONSENSE AND PUT HER ON THE BIG SCREEN!!! It's pretty ridiculous that this has been gestating in Hollywood for the past decade without any credible results. And BTW, why are they making an Ant-Man movie and they can't even make a Wonder Woman movie?...and who the hell is running the industry right now?! Although there is no official word on the background story of Wonder Woman in the new series - which still isn't a sure thing as NBC has only ordered a pilot for the show, which is described as "a reinvention of the iconic D.C. comic in which Wonder Woman -- aka Diana Prince -- is a vigilante crime fighter in L.A. but also a successful corporate executive and a modern woman trying to balance all of the elements of her extraordinary life." A vigilante crime fighter in L.A.? No, no, no, no, no, no, no, no, no, no, NOOOOO!!!!! She works for the government, in the military alongside Steve Trevor!! Now I'm starting to 'wonder' if I'll actually check this show out, even though at this point only a pilot has been ordered. I hear the pooch beginning to wail. You know why? BECAUSE IT'S BEING SCREWED!!! Updating my pro-website....a week and a half. Contacting over 70 post houses via e-mail with a link to the site....one entire day. Heading to San Francisco with Rebecca to meet with Bill B. for a seriously fun birthday weekend at Wondercon....priceless. My pro-website has been updated and is now ready to be sent out, once again, to the 73 other post houses I'm still trying to get into! I somehow thought it'd only take me a couple of days initially...yet here we are a week and a half later! But hey, it's still a hell of a lot less time than burning DVDs, printing resumes and cover letters, labeling and packaging everything up, then taking the lot to the post office! I'm really happy to have included several new trailers and broadcast spots. Since the DVD market went soft on 2009, my focus has been solely on what I came out here for in the first place. Even though I certainly enjoyed the four years I was also cutting DVD special features. Since 2003 it's always been a little of both and my wish now is to continue to get into the top houses. Happy Hour certainly still wants me on staff, but there has to be enough work to justify that yet. Right now I'm still a free agent and need to, as always, keep moving forward. It's a great sense of accomplishment to have completed this pro-site update....and here's to moving to the next level. Never still, never settling, never stopping! "Paul" was GREAT!! If you love classic sci-fi movie lines and connectors smartly rolled out with the right amount of Simon Pegg humor, go see this movie! Oh, and bonus points if you love Comic-Con. At the Burbank 16 right now about to head in to see "Paul". Reel and resume update: Week 1? O.K. so it's taking me a bit longer than expected to update my pro website. Some preliminary work involving some of the new clips bogged me down a bit. Looking to get the remaining elements in gear on Monday so I can upload everything to the site by Tuesday. Looks like I'll definitely be off work for another week but, even though I enjoy getting my reel and resume up to date, I DON'T want it to take up the entire five days! Time to wrap up and getting everything on it's way. Oh yeah, a little under two weeks to Wondercon! AND Bill B. is completely confirmed to attend!! Just found out his time-off request has been approved!! GOD BLESS IT!!! Started the process of updating my pro-website yesterday. Trailers and broadcast spots to add include "Splice", "Unstoppable", the DVD release of "The Book of Eli", and the series premiere of "Detroit 187". Looking to have everything up and running by the end of the week. Then it's on to the 73 post house bombing mission. A week ago this past Wednesday I had something occur with my Mini that I never thought I'd experience. Previous to that day I was getting an indicator light that said the engine temperature was going up. There's no needle in a gauge here, just two progressive icons (orange and red) that show how hot things are getting. Obviously something was wrong and I needed to bring her in for service. Only the orange light was coming on sporadically and on rare occasions when I was in very slow traffic. After stopping at an independent garage in North Hollywood that I was a little concerned with (not the best neighborhood) I made an appointment with Bob Smith Mini for their first available slot; two days later on friday. Exactly one half hour after phoning in my appointment, and as I was driving to work, the orange light came on followed by the red...and the red stayed on. I knew I needed to get her off the road as soon as possible but I was stuck in a right turn lane in heavy traffic. I made the turn slowly with everyone else, making my way from the left lane to the right, finally pulling the car over. At that moment the engine died. I tried to start her a few times and nothing. You could tell she was trying to turn over but just could not. I called AAA who responded in ten minutes, driving me with my my wounded car on a flat bed out to Bob Smith Mini. I really appreciated the driver telling me that it'd be less expensive to go straight there. Having a local garage check things out and possibly have to get another tow from there to the dealership would be double. After arriving at Bob Smith, they brought her in for a full diagnostic. The final word twenty four hours later: the engine overheated to the extreme and she'd need a whole new engine. Immediately I thought about my warranty which had just passed one of it's major milestones; 50,000 miles or four years which ever came first. My odometer read 53,000. Negotiating with the service desk that, with this major a breakdown and my only being 3,000 miles over, perhaps some type of helpful extension or assistance could be provided. She spoke with the Southern California rep. for BMW/Mini and came back that they'd be willing to cover the labor while I purchased the engine complete. This would mean I'd be paying for three quarters of the cost. That wasn't good enough for me so I asked to speak to the rep. myself. A further negotiation with him brought the cost to half and half. Better, but still needing more. I told him about how I really love Bob Smith Mini and intend to come back there after my current one is paid in full to buy the next Mini...even knowing what color scheme and configuration I want! He suggested I contact Mini Finance to help with my side of it. 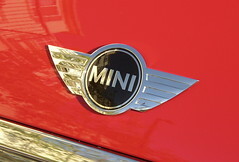 Mini Finance was very helpful and I am expecting to close the deal with them the first part of this coming week. The new engine needed to be ordered and will probably take a week to come in with installation taking another week. This process began last friday. So in six days I'll have my Mini back on the road with a new two year warranty and the odometer back to zero. Crazy. I really miss driving her, even though it's only been a week and a half. Over the past few days that's been accentuated by a bevy of Minis I've noticed on the road. Soon, all will be back to normal! After being here at Happy Hour Creative for just a little under seven months straight, my run has come to a brief conclusion. Finished up working on a trailer for a new Cartoon Network movie and was informed this afternoon that there's just nothing for me to do next week. This has now become the longest period of time I've worked at one post house (freelance) continuously since my career began!! And originally it might have ended last friday, but I received an extension due to additional changes from the studio. The good news is there are a number of projects just about to drop and that more than likely (I was also told) I'd be back here the week after, or at most the following week. More good news; I'm more than covered financially for this period of down time. But...there'll be no idle hands about it! The first thing I intend to do, above all else right away, is upgrade my resume and add more recent trailers and broadcast spots I've been working on to my pro website. Then it's firebomb time! I'll be making my usual round of e-mails to the now 73 post houses I continue to try and get into. Unfortunately I can't really turn around and contact some of my past post house affiliations due to a shift in the industry; The Cannery is no longer in business as of last year, and I've just removed that link from this site. New Wave Entertainment was hit hard by the softening of the DVD market and that's primarily what I cut there. What I need to focus on now is moving forward, even though I very much look forward to returning to Happy Hour in the very near future. Aside from furthering my career, this short time off will allow me to take care of some other things that have been piling up due to the shortage of time brought on by 7 months straight of work. Plus, I can actually SLEEP IN!! WOOHOO!!! I almost forgot what that was like! My MINI update is coming next. No surprise guests during Saturday's "Tron" 70MM screening at the Aero Theatre, but definitely a very informative Q&A. We learned A LOT of stuff about how the software team worked out shot key frames, transposing computer shots to 170,000 cells that all had to be photographed one at a time, and the total lack of being able to view a moving computer animatic to adjust a vehicle's pitch and yaw before render. Not to mention the fact that any shots Steve Lisberger (who was in attendance) had to approve were photographed with a polaroid camera off the computer screen and mailed to him for review! Crazy! BTW, the print looked AMAZING! We're at the Aero Theater right now about to head in for a 70MM screening of the original "Tron" plus a Q&A with Writer/Director Steve Lisberger and some of the VFX crew. Really hoping Bruce Boxleitner and perhaps even Jeff Bridges show up as surprise guests! Here's a couple of videos I shot at Gallifrey One of a Dalek roaming the halls and offering fans Jelly Babies and Jammie Dodgers. You can also check out a smattering of photos from the weekend right here on my Flickr set. First clip, a spot-on recreation of the Dalek named "Ironsides" from the episode "Victory of the Daleks" making his way through the crowd of amazed Who fans! He made several appearances over the course of the weekend, here once again offering people Jelly Babies but warning those who reach for the Brit candy: 'DO NOT TAKE THE RED ONES!!!' Just brilliant!! Of course Jelly Babies were the iconic favorite treat of Tom Baker's Doctor. BTW, these are both in HD so check it out. "Blade Runner": should Hollywood go back there? There's been an awful lot of chatter online over the past day about Alcon Entertainment, the studio behind "The Blind Side" and "The Book of Eli", having purchased the rights to make a movie based on the characters and settings of "Blade Runner". So that pretty much covers my take. We'll see how all of this pans out in time, but it certainly has sparked my interest in perusing the rest of Deckard's Briefcase, the DVD set that came out right after the theatrical release of director Ridley Scott's 'The Final Cut' in 2007. Surprisingly, I've still only watched the 3 hour long 'Dangerous Days' documentary which was brilliant! There's so much to go through and I just got sidetracked at the time. Oh and BTW....if they do a new movie, Vangelis HAS to do the music! HAS TO!! Watch this incredible ILM "Tron Legacy" effects montage! No VO, no talking heads...just footage, footage, FOOTAGE! A number of amazing composite breakdowns that I'm sure will be in the forthcoming DVD release. Help save the Lars Homestead! DING, DING! DING, DING! Wondercon as now at the 30-days-to-go mark! That is all!